Curve-fitting leaves a lot to be desired. 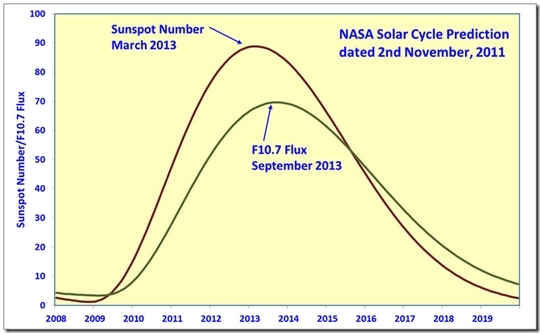 Even late in the progression of Solar Cycle 23, the curve fitters in NASA had poor predictive ability. Altrock had observed that solar maximum occurs when the “rush to the poles” reaches 76°. The magnetic poles of the Sun reverse at solar maximum, which is also considered to be the beginning of the new extended solar cycle. We also observe that solar minimum for the last four minima has occurred when emissions are exhausted at 10°. The latitude of 10° is shown as the red line on the diagramme. Further to that, the last two solar cycles show that the month of minimum can be predicted by drawing a line between solar maximum (the point at which the rush to the poles intersects 76°) and the point of exhaustion at 10°. The bulk of activity is bounded by this line. Altrock has noted that the “rush to the poles” in Solar Cycle 24 is much weaker and much slower than in previous solar cycles. The line he has drawn intersects 76° in mid-2013, consistent with other predictions of Solar Cycle 24 maximum. 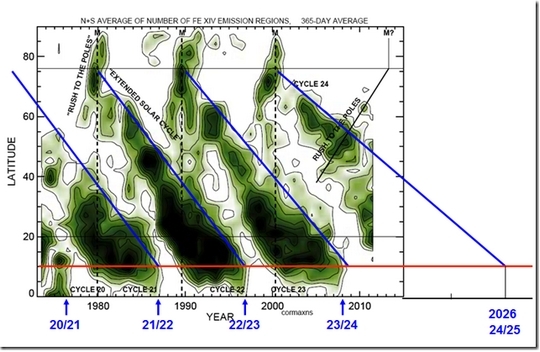 The shape of the emission regions also suggests that Solar Cycle 24 will be quite extended. The blue bounding line from the Solar Cycle 23 maximum intersects 10° latitude in 2026, making Solar Cycle 24 eighteen years long. 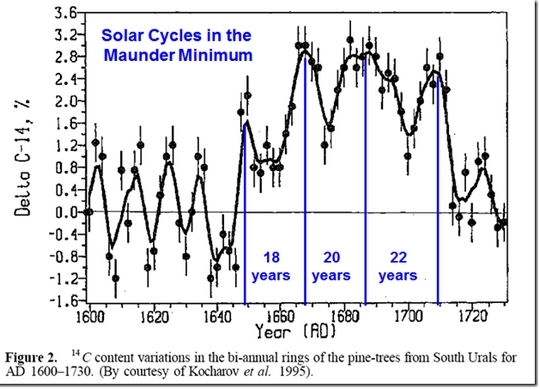 It seems that the first solar cycle of the Maunder Minimum was also eighteen years long. An eighteen year long Solar Cycle 24 would be very significant in that it would be five and a half years longer that Solar Cycle 23. With the solar cycle length/temperature relationship for the US-Canadian border being 0.7°C for each year of solar cycle length, a further cooling of 3.8°C is in train for next decade. The evolution of Altrock’s green corona emissions diagramme as a predictive tool will be followed with some interest. 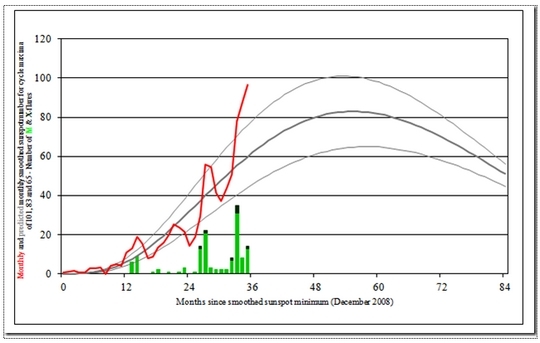 Back to the subject of curve-fitting, it may be still too early to call Solar Cycle 24 using that technique. The following graph shows the raw monthly data for sunspot number amplitude for Solar Cycles 5 and 6 (the Dalton Minimum) with Solar Cycle 24 to date aligned on the month of minimum. 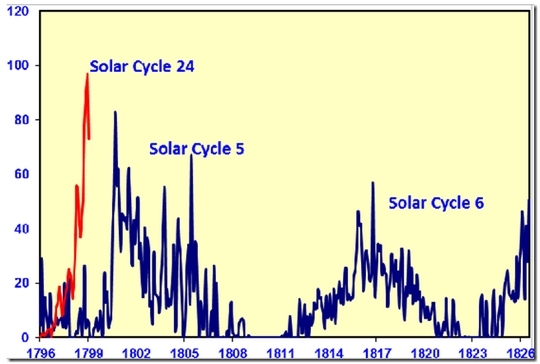 Solar Cycle 5 took about four years to get going before it had a sudden burst, and then died off over the following ten years. It is still a bit too early to be certain about how Solar Cycle 24 will shape up.